The first El Camino was produced for the 1959 model year (two years after the Ranchero) and was based on that year's Chevrolet Impala. The name "El Camino" means "The Road" in Spanish. The car's development was rushed, and it was not as successful as the Ford, with 22,246 built the first year. The 1960 model tracked the changes on the Impala, with an extensive restyling. Sales were down at 14,163 and Chevrolet decided to discontinue the model. In total, 36,409 first generation El Caminos were produced. Four years later, with Ford's Ranchero still selling well, Chevrolet reincarnated the El Camino, based on the new Chevrolet Chevelle platform. That 1964 model was basically identical to the Chevelle forward of the B-pillars, but Chevrolet considered the vehicle a practical, utility model and the Chevelle's most powerful engines were not available. 1965 saw the availability of performance versions of the 327 engine with some 350 hp. 1966 brought added a 396 in� engine to the lineup rated at 325-375 hp. The 1965 327 would run low 15s in the 1/4 mile (at some 90 mph), while 1966 to 1969 models were easily into the mid- to upper-14s. 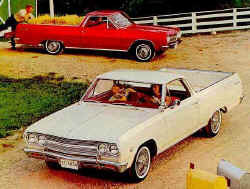 The El Camino followed the Chevelle's styling update for 1967, with a new grille, front bumper, and trim. Air shocks were introduced, allowing the driver to compensate for a load. 1968 introduced a longer El Camino, based on the station wagon/4-door sedan wheelbase. A new, high performance Super Sport SS396 version was launched, alongside the Chevelle version. 1969 models were very similar, but 1970 saw the availability of a new SS396 which actually displaced 402 in� (although all emblems read 396). Chevrolet's largest and most-powerful engine of the time was also put into a select few El Caminos. The LS6 454 in� engine, rated at 450 hp and 500 ft�lbf of torque, gave the El Camino 1/4 mile times in the upper 13 second range at almost 105 mph. The 1971 model saw reduced power and performance, along with the rest of Chevrolet's line, as lower-octane unleaded fuel was mandated, and emissions controls began to be felt. Single headlights replaced double for 1971, and the grille came now to a point. Little changed but still lower power outputs for 1972. A rebadged El Camino called the GMC Sprint debuted in 1971. For 1973, the car was restyled again, matching changes to the Chevelle. It was the largest generation of El Camino, but thanks to lighter construction, it weighed less than the previous generation. A front-end restyle with quad stacked headlights was done in 1976, but otherwise it was the same car until 1978. A new, smaller El Camino was unveiled in 1978, with more sharp-edged styling. Since the Chevelle was no longer produced, the El Camino instead shared components with the Chevrolet Malibu and Chevrolet Monte Carlo. V6 engines (based on the Buick or Chevrolet 90-degree V6) were available for the first time, and from 1982 through 1984, Oldsmobile-sourced diesel engines. After 1984, GM shifted El Camino production to Mexico for three more years. Production ceased after the 1987 model year, as sales of the Chevrolet S-10 were outselling its passenger car counterpart. 1984 to 1987 El Caminos (and its sister, the GMC Caballero) were produced in Ramos Arizpe, Mexico. Around 200 unsold 1987 El Caminos were sold as 1988 models.